AOPA’s 101st National Assembly proved to be another success for AOPA and the O&P community. Exhibitors and attendees came from over twenty countries, making it an insightful global event. 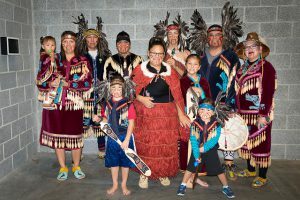 The exhibit hall opened with an original performance from MUSQUEAM – “People of the River Grass.” The Musqueam people are the oldest known residents of Vancouver and have lived here for thousands of years. 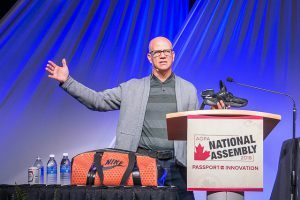 The morning opening session featured key note speaker, Tobie Hatfield, senior director of athlete innovation for Nike. Following Hatfield’s world class insights, were the Award Winning Thranhardt Lecture series. 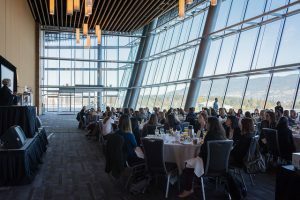 The educational line-up included Outcomes and Evidence-Based Practice in P&O: How are you Documenting Value in your Clinic and Using it to Improve Reimbursement? Presenters of this panel included James Campbell, PhD, CO, FAAOP, Brian Hafner, PhD, Andreas Hahn, PhD, PE, Russell Lundstrom, MS, Brittany Pousett, CP( c), MSc, and Scott Sabolich, CP. Friday morning’s AOPA Annual Membership Business Meeting presented the Lifetime Achievement Award to C. Michael Schuch, CPO, FAAOP, FISPO (deceased). Barbara Schuch accepted the award on behalf of her husband. The Ralph R. “Ronney” Snell, CPO, FAAOP, Legislative Advocacy Award was presented to both Denise Hoffmann and Pam Lupo, CO. The Edwin and Kathryn Arbogast Award for best prosthetic abstract was presented to Katherine Ching from the University of Pittsburgh for An Analysis of Internal Consistency within OPUS in Upper Extremity. The Otto and Lucille Becker Award for best orthotic abstract was presented to Peter Zenger from the University of Pittsburgh for Self-Efficacy Related to Education Level in O&P. Popular education sessions included, Technology for Geriatrics, WHO Standards for Prosthetics and Orthotics (Policy, Products, Personnel, & Provision), Multi-disciplinary Panel on Rehabilitation of the Paretic Arm, and Business Management for Today’s O&P Facility, to name a few. Saturday featured a key note by Mike Schultz, two-time Paralympic medalist, followed by a summation of Orthotics 2020 – Defending the Future of Orthotic Care, presented by Tom Fise, JD, and Nicholas LeCursi, CO, which discussed the establishment of the Medical Advisory Board (MAB) who are working cooperatively to advance non-branded studies and data to assess outcomes across identified categories of treatment. Five workgroups have been established to focus on the areas of stroke, osteoarthritis, cranial orthoses, scoliosis and spinal bracing. Attendees enjoyed the various Special Events happening in the Exhibit Hall, such as the Slap Shot Hockey Game, sponsored by ALPS, with prizes up to $100 and the annual Technical Fabrication Contest with twelve winners totaling prizes of $4200. 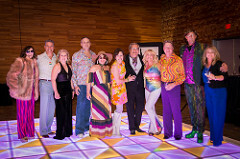 The Party with a Purpose fundraiser for AOPA’s government relations efforts brought in over $30,000, at an exclusive party featuring a 1970’s theme. A special and resounding THANK YOU to the sponsors of the 2018 AOPA National Assembly! AOPA could not create such a successful event without our incredible sponsors. See all the photos on Flickr and search #AOPA2018 on Twitter. Peruse the program below to view all the opportunities the 2018 Assembly offered. Save the Date: AOPA National Assembly in San Diego, September 25-28, 2019.